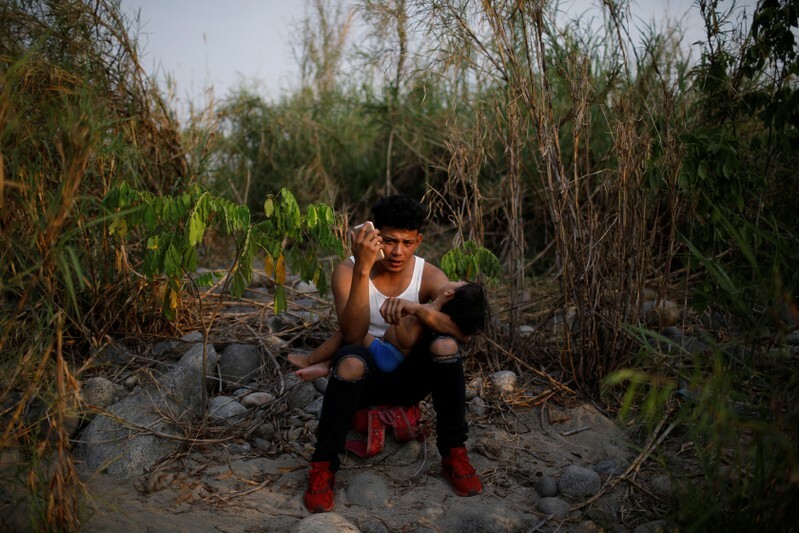 MAPASTEPEC, Mexico (Reuters) – Amid pressure from Washington, Mexico is backpedaling on promises of better treatment for Central American migrants, leaving hundreds stranded in unsanitary camps near its southern border and allegations of irregular detentions. Mexican President Andres Manuel Lopez Obrador promised more humane treatment for Central American migrants when he took office in December. His left-leaning government issued thousands of year-long humanitarian visas in January, giving migrants legal access to jobs and the right to travel to the United States. However, caught off guard by a surge in arrivals, Lopez Obrador’s administration is resorting to old tactics based on tough law enforcement. Mexico has halted the liberal visa policy and ramped up detentions of migrants heading north, government data shows, following criticism from U.S. President Donald Trump of a jump in the number of Central American asylum seekers reaching the U.S. border in February. Trump, who is expected to make border security central to his 2020 re-election bid, has vowed to limit trade with Mexico if it does not help slow immigration. While Lopez Obrador’s government has said it will not react to “threats”, sources familiar with Mexican policy, who asked not to be identified, said near-daily U.S. government pressure had led the interior and foreign ministries to push the National Migration Institute (INM) for tougher action. Unreleased INM data, reviewed by Reuters, showed that it detained 12,746 undocumented migrants for registration in March, up by nearly one-third from February and two-thirds from January. The agency also stopped processing new applications for humanitarian visas on Jan. 28, after issuing some 13,000 – mostly to Central Americans arriving that month in the southern border state of Chiapas, the site of most migrant arrivals. A few thousand more visas were issued in February, but none since, said an INM official in Mexico City, who was not officially authorized to speak to the media and asked to remain anonymous. INM said in a statement earlier this month it remained open to issuing humanitarian visas in Chiapas, with priority given to women, children and the elderly. In Chiapas, the INM’s decision to close its main office in the border city of Tapachula a month ago has forced hundreds of migrants to travel 65 miles (105 km) north to the smaller town of Mapastepec, where they have languished in sweltering temperatures, hoping for humanitarian visas. “It’s madness that they’re making us wait so long. For what? For nothing!” said Daisy Maldonado, a 26-year-old from Honduras, camping in a field in Mapastepec opposite a sports stadium. Hundreds of bedraggled men, women and children have been sheltering for nearly three weeks inside the stadium, as migration officials registered their identities while neglecting the group camped over the road, rights groups and migrants said. Without water, medical help or government attention, Maldonado’s group was dependent on scant handouts from locals, they said. Maldonado’s daughter, Marisol, 5, wailed with hunger beside her, in a bivouac she had built from dried palm branches. A coalition of over a dozen human rights and humanitarian aid groups operating in Chiapas has called the buildup of stranded migrants a “humanitarian crisis,” and said the confusion over visas was worsening the plight of migrants. INM Commissioner Tonatiuh Guillén López said in a recent interview his agency was taking a “stricter” approach in southern Mexico because of the influx of migrants in Chiapas. However, he denied that was a response to U.S. pressure and said Mexico was pressing ahead with more humane migration policies. INM officials said they closed the main regional office in Tapachula on March 15 after Cuban migrants stormed the premises, enraged that they were not seeing faster results. Rights groups and migrants, however, dispute this. Nonetheless, the closure has created a bottleneck of visa applicants, hundreds of whom headed north to Mapastepec. On Saturday, INM suddenly halted registration at the stadium in Mapastepec and said migrants would have to wait at least a month longer. INM said work had been stopped after some migrants had caused a disturbance requiring police to intervene and registration would continue at another site, without providing details. Even those who had been registered inside the stadium had been given no indication from INM officials if or when they would receive humanitarian visas almost two weeks after being processed, said Silvia Rodriguez, 26, a Honduran citizen. On Wednesday, the INM said it would not issue any humanitarian visas in Mapastepec, but migrants would instead be able to request a seven-day permit to visit Mexico’s southern border states, which would not allow them to journey northward. It also said migrants would be notified of that once an evaluation of the registrants was completed. Despite the uncertainty, many migrants preferred to wait to request legal status before continuing their journey in caravans. Migrants who travel alone and without papers in Mexico are frequent prey for kidnappers and smugglers, in addition to risking detention or extortion by police. “Migration officials are grabbing us like pigs,” said Morazan, traveling with two children. In an effort to stem the build up of migrants in Chiapas, INM said this month that citizens of El Salvador, Honduras and Guatemala will be able to register for the visas through Mexican consulates in their home countries from late May. While INM closed its registration offices in Tapachula, a detention center at the site remains open. An increase in detentions in the border area means the site is crammed with 1,700 people, the rights collective said in its report. That’s about double its capacity and double the usual number held there, according to migrant group Fray Matias, which monitors the center. The collective reported black eyes and bruised bodies among detainees it said were the result of beatings by police who entered the center to control a disturbance last week. Reuters was not able to independently verify this. Mexican law enforcement representatives did not immediately reply to requests for comment. Lacruz of Fray Matias said at least 30 migrants had been irregularly detained at the Tapachula facility despite having applied for asylum with the Mexican Refugee Help Commission (COMAR), in contravention of Mexican law. INM did not respond to requests for comment about the allegations of overcrowding and irregular detentions. The institute says that migrants held in its facilities are not detained but are simply being held for processing, though rights groups and migrants say they are not free to leave, often for days or weeks. Many undocumented migrants are also deported after processing in the centers. Mexico flew about 60 Cubans back to the island this month and sent 204 Hondurans home on Saturday..
Richard Pioenza, a U.S. citizen originally from Cuba, said his wife Yildiz Gomez had been held more than 20 days in the center despite having papers showing she had applied for asylum. Reuters was unable to contact Gomez directly. Pioenza said his wife applied for refugee status after arriving in Mexico in March to ease her passage to the U.S. border where she was planning to apply for asylum from political repression in Cuba. After a request from Reuters for verification on Gomez and five other cases of suspected irregular detentions, the Mexican refugee agency said on Monday it would send a team to the center.